So much of American history involves economic events. Whether it is the American Revolution or the Civil War, The Great Depression or The New Deal, much of what we teach in U.S. history is about economic events as a primary cause and/or effect of the political, military and social history that forms the central narrative of American history. With a fuller and deeper understanding of economic processes and institutions, students can have a more complete understanding of why certain events happened. They can see how individuals and the society made choices and they can recognize the unintended economic consequences that often occurred. And with that greater knowledge, students can better analyze the choices and decisions they will need to make in their own lives, as both individuals and as engaged citizens shaping the future of our nation. 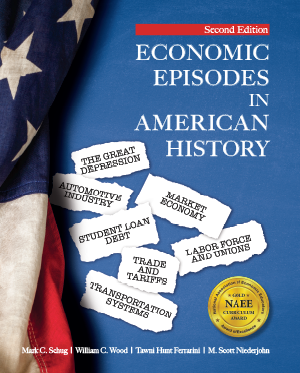 This is the first way in which Economic Episodes in American History, Second Edition provides an enhanced understanding of history and expands the critical thinking skills of students. In all of American history there is often an important economic factor at work. Even for those areas of U.S. history that are not primarily about economic events, economics is often an important factor in what happened, helping to explain the issues involved. Whether it is about the structure of the U.S. Constitution or immigration, the Civil Rights movement or the role of women in the workplace, understanding the economic factors at work enriches and expands student understanding. Students go beyond what is usually provided in the standard textbooks and gain new insights. This is the second way in which Economic Episodes in American History, Second Edtion provides an enhanced understanding of history and expands the critical thinking skills of students. An understanding of American history is increased when viewed through an economic way of thinking framework. An economic perspective is both about economic events and about an economic way of thinking. That economic way of thinking is a valuable tool for analyzing and understanding history. Chapter One’s explanation of the economic way of thinking provides a framework for students to analyze the choices made throughout American history. This approach takes a careful look at the choices being made, the costs involved in those choices, the incentives that motivate choices, the rules that guide interactions, and the possibility of unexpected consequences. With this framework, students learn to understand and explain American history, both in economic and non-economic ways. This is the third way in which Economic Episodes in American History, Second Edtion provides an enhanced understanding of history and expands the critical thinking skills of students.